Alex Bretherton has put his retirement on hold and will remain at Batley Bulldogs next season. Alex Bretherton has made a U-turn on his planned retirement and has agreed to remain at Batley Bulldogs next season. 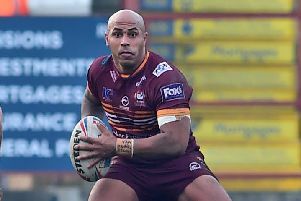 The popular back rower, who has played more than 120 games in six seasons for the Bulldogs, had indicated he was about to hang up his boots until a chance meeting with Batley chairman Kevin Nicholas while on holiday. The pair shared a round of golf, during which time Bretherton agreed to put his retirement on hold to stay at the Fox’s Biscuits Stadium. Bretherton made 23 appearances for Batley last season, scoring a try, while he looked to have signed off his career by landing a conversion from the last kick of the season in the emphatic 60-12 win over Hunslet Hawks. Bretherton admits he is raring to go after agreeing to continue and told the Bulldogs website: “I felt it was time to finish but now I have seen the new signings it gave me a buzz and I felt it would be great to be a part of it. “Physically, I still feel fit and when I spoke to Kevin, I thought I need to give it one last shot, so I said that I would go into pre-season and give it my best and see how it goes. One player departing Batley is centre Ayden Faal, who has joined League One side Hunslet Hawks. Faal was restricted to just four appearances during an injury ravaged campaign and returns to Hunslet, where he previously had a spell in 2009.